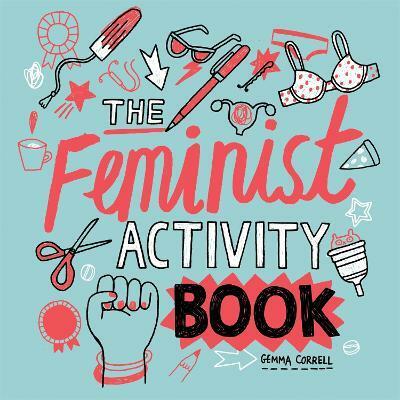 Looking to smash the patriarchy and get your arts and crafts on?Want to have a laugh while taking down sexist stereotypes?Look no further than Gemma Correll's Feminist Activity Book , where your dress up doll can wear whatever she wants and the only thing limiting your sexuality is the size of your coloured pencil collection. Welcome to the games, colouring projects, and crafts of your egalitarian dreams! The Feminist Activity Book has everything you need to usher in an era of colourful and intersectional joy. Featuring such activities as Feminist All-Star Trading Cards, Destroy the Page-Triarchy, Sexist Social Media Bingo, and A Feminist ABC, The Feminist Activity Book will fuel your feminist rage, remind you to laugh once in awhile, and bring you one step closer to an egalitarian utopia, or whatever. Gemma Correll is a cartoonist, writer, illustrator and all-round small person. She's the author of A Cat's Life, A Pug's Guide to Etiquette and The Worrier's Guide to Life. She publishes the "Four Eyes" cartoon at GoComics.com and at The Nib on Medium.com. She also draw a monthly Skycats cartoon for Emirates Airlines' Open Skies magazine.